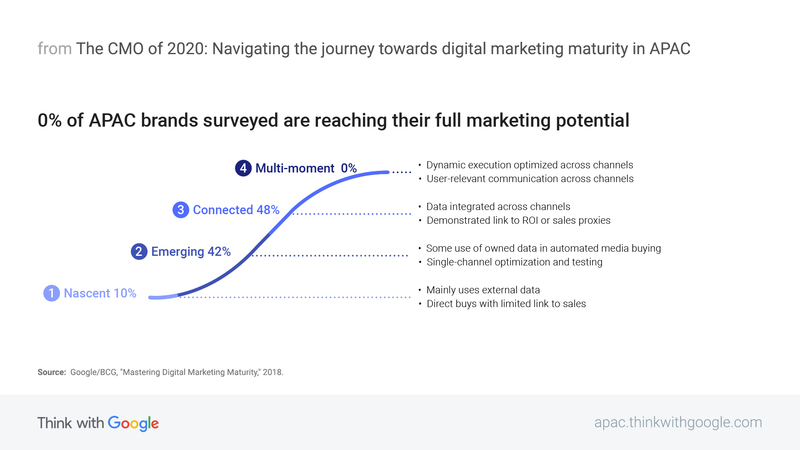 Sapna Chadha, Google’s head of marketing in Southeast Asia and India, lays out three steps to help CMOs move their brands toward digital marketing maturity while delivering the best possible online experiences. Brands that reach full digital marketing maturity see an average increase of 11% in revenue and 17% in cost-efficiency. At that stage, they’re able to harness data in a way that makes every consumer interaction — across different channels, platforms, and ad formats — a highly personal, relevant, and meaningful experience. The ultimate goal of digital marketing maturity? Maximizing the lifetime value of the customer. Achieving such levels of returns and efficiencies — the holy grail of marketing — has led us to wonder how more companies can achieve this. 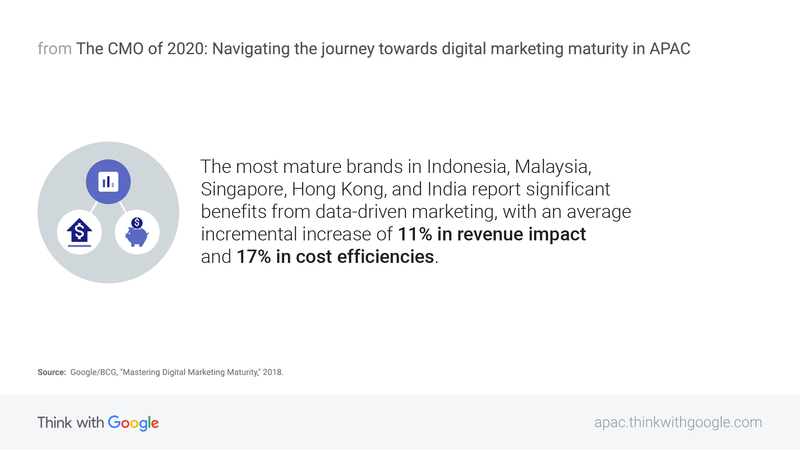 We partnered with the Boston Consulting Group (BCG) to look at the digital marketing maturity of more than 30 brands across seven industries in Indonesia, Malaysia, Singapore, Hong Kong, and India.1 The results were eye-opening. Surprisingly, while the brands share a number of success factors at different levels, not a single brand reached multi-moment, the highest degree of maturity. 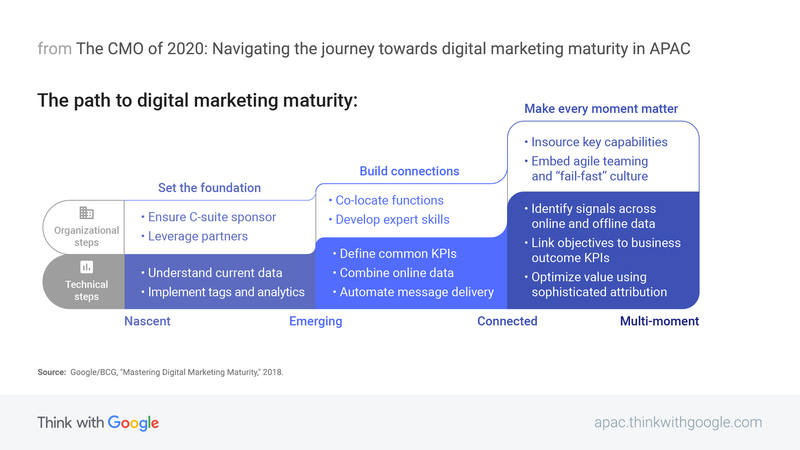 Aligning on the steps to digital marketing maturity — both organizationally and technically — is crucial to setting a company and its campaigns up for success. Today’s consumers expect every online interaction with a brand to be fast, seamless, and relevant. If that expectation isn’t met, they’re happy to look elsewhere. This has put more pressure than ever on marketers to ensure they’re connecting meaningfully with consumers at every opportunity. It’s essential for every brand ... so why weren’t any doing it well? While every brand’s approach to creating better ad experiences may differ, we believe that data and technology should always play a central role. So, based on the research study, BCG mapped out a plan to help brands — including Google — move up the digital maturity curve. Leaders aiming to reach the multi-moment level of maturity need to start by taking an honest assessment of where they are on the maturity scale. Then they can focus on taking the steps to move their companies up the curve. Brands at the nascent level need to set the foundation. Brands at the emerging level need to build connections. Brands at the connected level need to make every moment matter. Getting both internal and external alignment and support right from the beginning will go a long way. Organizationally, identify support from executives and enroll partners to help fill any capability gaps. From a technical standpoint, brands need to understand what data is available and use website analytics and tags to harvest customer insights. That will ultimately help carve out the most relevant content and audience segments to focus on. The next stage is to ensure everyone’s abilities are being used wisely. Focus on developing expert skills within the organization and driving cross-functional alignment on common KPIs. Technically, integrate web analytics and ad tech to streamline your media buys and serve highly personalized, insights-driven ads. That will ultimately help you build better connections with consumers. Finally, power up your teams with the best possible talent and then empower them to embrace innovation and “fail fast” learning opportunities. Best practices need to be consistently shared across teams — not enough companies do this. On the technical side, prioritize choosing the right metrics based on your brand’s goals and identify key signals across your online and offline data to accurately measure each online interaction. CMOs today, especially in APAC, have a lot of unique challenges to conquer, but that’s also where the most exciting opportunities lie. We know it won’t be easy because our marketing team at Google also participated in the BCG study, and we weren’t in either of the top two tiers; we landed in the “Emerging” category. That was a real wake-up call for us. We were doing our best, but we were still far from delivering the best possible marketing experiences to our clients. Based on BCG’s road map, we re-examined some of our campaigns and realized that better applications of technology would make our ads more useful to our consumers. As a result, in our #LookBeforeYouLeave campaign for Google Maps in India, we used our weather API to create dynamic, real-time ads that encouraged users to check traffic conditions before hitting the road in inclement weather. In another case, when we launched Google Home in Australia, we knew promoting such a highly personal product would benefit from highly personalized messages. With Director Mix, we were able to harness intent signals to create more than 100 unique, tailored YouTube ads showing how Home could be helpful and relevant in Aussies’ daily lives — all from a single original video. Embarking on this digitization journey starts with being honest about where your business currently sits on the spectrum, focusing on small steps to move up the curve, and, ultimately, reaping the results. Executives from the brands below are already embracing a new mindset — are you 2020 ready? 1 Google/BCG, "Mastering Digital Marketing Maturity," 2018.